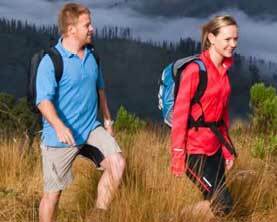 The Grand Strzelecki Track - Walks of discovery in the Great Forest, National Parks and hidden wild places of the Strzelecki Ranges. It has been very disappointing to find people have been lighting campfires at various rest areas, any person lighting a fire will be charged with arson offences. The forest is extremely dry and people who don’t follow the protocols are putting lives and property at serious risk. If this behaviour continues we will have no alternative but to close the Track indefinitely. The Park to Park section of the Track is open again as of April 1st. Please check the website for any changes before you set off. The Track will be affected by logging operations on Taylors Road. Detours have been organised and these will be signposted on the Track. Walkers should obey road traffic control and other Forestry operations signage where it is present. Unless otherwise directed never approach closer than 2 tree lengths to any machinery involved in harvesting operations. Some work will be done in the area around Road 31 and Road 57 felling fire affected trees. This will last for about 2 weeks. The Track will not be closed during this operation. There will be operatives in radio control with the harvester at each end of the operation and walkers will be stopped at the site entrance while harvesting is halted so they can walk through safely. It will be a delay of only 2- 5 minutes. WALKERS MUST OBEY THE INSTRUCTIONS GIVEN TO THEM. The new PDF maps are now available through the Avenza Map Store. They will sell for about $10 each. 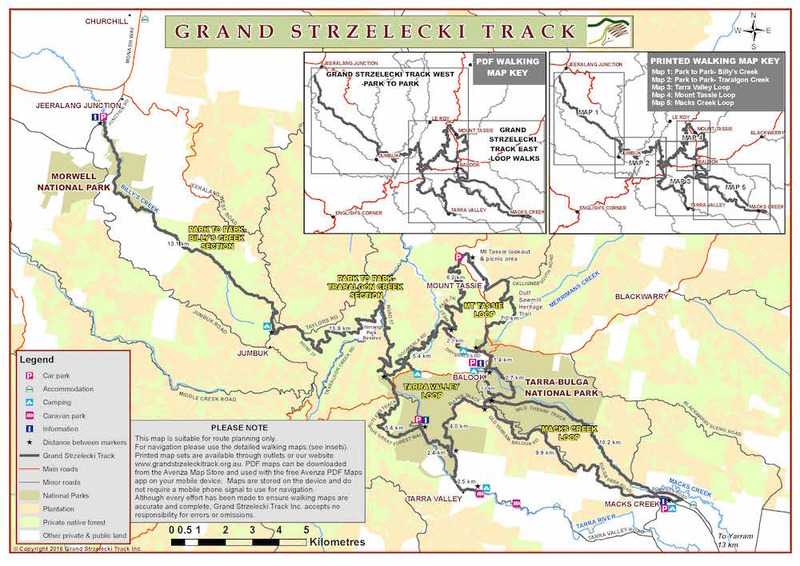 There are two maps – Grand Strzelecki Track West and Grand Strzelecki Track East. The West map covers Morwell N.P. to Balook(Park to Park) and the East map covers the loop walks. Please see the information for walkers page. All sections of the Track are currently open. However we have had some terrible gales recently so there maybe fallen trees on all sections of the Track. Please let us know if any sections are difficult to get through. The second (2016) edition of our souvenir walking maps is now for sale (see the shop page). They feature improved accuracy, up to date information on walks and facilities and a selection of new photos. We urge you to be well prepared with these maps if planning an extended walk. 100% of the sale price goes towards the maintenance and development of the Track. Come and stand in awe under forest giants, or step into a lost world of ancient temperate rainforest equal to any on Earth…yet not hear a sound except the serenade of lyrebirds. Come and walk in solitude through a different rainforest so rare, most people have never heard of it, and far fewer will ever see it. Come and discover peaceful, beautiful places far from the beaten track, and away from the parks all the tourists visit. And when you need to reacquaint yourself with the comforts of life, try a home cooked meal in a friendly country guest house or a cozy cabin in a tiny, peaceful hamlet amidst all this natural beauty. Come and discover the Grand Strzelecki Track! 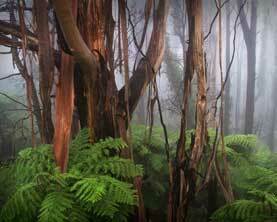 Home to the tallest flowering plants & hardwood trees on earth, the majestic Mountain Ash (Eucalyptus regnans), the Strzelecki Ranges of Gippsland are like no other place. The massive trees and prolific jungle-like undergrowth that cloaked these ranges when white settlers first arrived became known as The Great Forest of South Gippsland, or simply The Great Forest, a title which is an integral part of Gippsland’s history and heritage documented in such publications as The Land of the Lyrebird: a Story of Settlement in the Great Forest of South Gippsland (1920). Much of The Great Forest was lost to sawmilling and settlement, but examples are alive and well in the eastern Strzeleckis where they are now preserved in Morwell National Park, Tarra-Bulga National Park, the Gunyah Rainforest Reserve, and 30,000 hectares of privately managed protected forests connecting and surrounding these core areas. With its high rainfall and deep, fertile soils, this is one of the most prolific environments on earth where regrowth forest from the 1939 and 1944 fires is already 50 metres tall. Until the Grand Strzelecki Track was built, most of these forests were inaccessible to the public except for short walks in the two National Parks. Now bushwalkers can traverse from Park to Park and enjoy extended walks beyond park boundaries, discovering clear mountain streams, hidden natural treasures, waterfalls, sweeping views, rare and endangered ecosystems, and flora and fauna that most visitors to the region have never seen. Amongst this fauna is the South Gippsland Koala, which is a healthy and genetically intact wild koala population unique in Victoria. The Grand Strzelecki Track also reveals the amazing and sometimes tragic settlement and sawmilling history of the Strzeleckis, along with recent conservation initiatives to preserve and restore our natural heritage. There are no tourists by the bus-load and many Melbourne tourism promoters are not even aware we exist, which ensures you get a unique personal experience. At the same time we are easy to find with 4 entry points located 10 minutes to ½ hour from the Gippsland towns of Churchill, Traralgon or Yarram. We have walks for everyone, regardless of your level of experience or fitness, so come and breathe the fresh air and lose yourself – or discover yourself – in this lost world which most trekkers still don’t know exists! 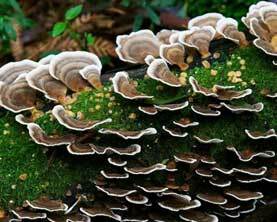 Walks of discovery in the Great Forest, National Parks and hidden wild places of the Strzelecki Ranges.